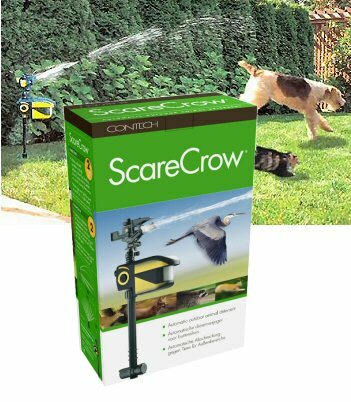 The Scarecrow sprinkler is simply an excellent product, that REALLY WORKS. If you have ever had to deal with the difficult problem of (usually other people's) pets using your lawn to relieve themselves, stopping a heron devouring the fish in your pond, or simply keeping birds off the vegetable patch, you will know that there are many solutions to the problem, but that nearly all of them don't work. Well, this one really does work. When the Scarecrow senses an intruder it instantly triggers an impulse water sprinkler towards the trespasser. The effect is both startling and immediate! Animals quickly get out of the area and avoid it in the future. The Scarecrow requires a garden hose connection and one alkaline 9 volt battery. We have also discovered, incidentally, that the Scarecrow is also very much loved by children as a great way to cool down in the summer! By the way, if you are looking for something that is visually more discrete, simply remove the optional yellow-coloured decals on the top, revealing a black less-obtrusive design. Scarecrow senses animals the same way security lights detect people: movement and heat. When Scarecrow sees an animal, it instantly sprays a pulsating three-second water burst. This startling but harmless action is a remarkably effective deterrent. 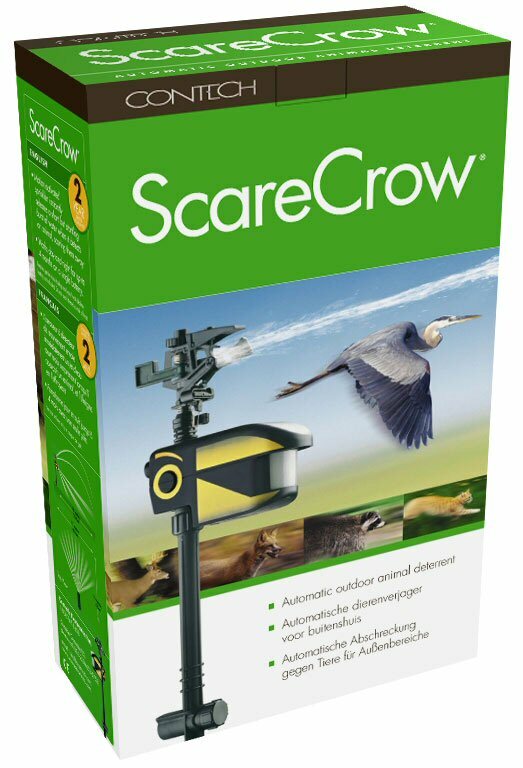 Scarecrow's combination of sudden noise, movement, and water keeps unwanted animals away. 1. Position the Scarecrow so the area you wish to protect is within its 105 degree detection area. Avoid pointing it at any objects where movement may cause "false triggering" ie: sidewalks, roads or waterfalls. 2. Adjust the sensitivity dial to the lowest setting that will still pick up your target animal, (see chart on page 6 in the instruction manual). 3. Fine tune the sprinkler to ensure the water covers the area you wish to protect.